The Improving Birth rallies started last year. I attended one then. I believe in the concept of “improving birth”, passionately. Some, like the wonderful Carla Hartley, will argue that birth itself is not something that needs improvement. That may be true, but the phrasing is not a sticking point for me. I think the idea is improving the current climate of birth, which is birth as we are presenting it to women. It is for this that I joined the rally last year and participated in my own special way this year. There are other sticking points for me, however. I’ll explain. I was informed by a group of friends that Improving Birth had been involved in pushing for legislation regarding midwifery. I do somewhat remember these events they say were somehow related to that goal, such as last year’s rally follow-ups: “write-in”, “walk in”, etc.– which actually inspired me to write letters I would never send to my former health care providers. (It was a good catharsis for me, and I didn’t feel it would be beneficial in my particular case to confront these people directly.) There was apparently some outcry within the community and no proof remained of this on the Improving Birth website. The website has gone through several changes since (in the past year), with no mention of any of this, and no official response. If you talk to anyone with Improving Birth, they maintain that there is no agenda regarding midwifery regulation. Anyway, trying to further regulate (and thus, medicalize) birth alarms a lot of us interested in improving birth because legislation aimed towards midwifery has been harming women’s births. Specifically, my circle of friends linked Improving Birth with The Big Push for Midwives campaign, which they asserted did have to do directly with the cause of midwifery licensure. Now, I had no idea of any of these connections or goals within the organizations– it was all news to me. A word on laws regarding birth. Why is midwifery legality such an issue? It removes choice. It varies state by state in terms of who women can hire for their births. This in turn affects what type of births women are “allowed”. In some states, homebirth midwifery is illegal. In other states, you have to have a very specific (medical) certification to legally practice as a midwife. In certain states, you can hire anyone as your midwife, regardless of their credentials or qualifications. I brought up Improving Birth on my page in this thread, expressing my newfound reservations towards the movement. I didn’t want to outright connect Improving Birth with The Big Push or midwifery regulation– I had no proof. I hoped that others could offer their perspectives to shed light on the topic. Truthfully, before my friends even alerted me to the connection possibly existing between those organizations mentioned, I felt wary. Something didn’t feel right. The rally of the previous year felt almost ineffective to me. I felt good making my signs and saying what was on my mind, standing on the sidewalk in front of a hospital… but I wondered, did this matter? Was I getting through? Cars watched us and passed. A local news reporter briefly came and spoke to us (it seemed like maybe a couple dozen of us were there). A story ran in the paper. We were all proud to be a part of this, but it didn’t seem like a big deal. Maybe other cities felt differently, with booths, and huge turnouts. Maybe this was a regional issue, I thought. I felt like we were just a bunch of nice ladies holding signs. This year looked like it could be the same, or worse. Days before the event, they still didn’t have a location. It appeared that only something like 10 people had committed to attending the event. Other things that irked me that year creeped up again this year as the rally approached. The idea that “this is not a protest”. Why is that so important? If someone accidentally calls it a protest (and not a “rally”), we’re afraid of all being seen as militant? Is protesting something mean, naughty, or has it ever done some good in this world? Okay, maybe that’s just me. The idea that midwives deserve all the love and it’s the bad OBs we are questioning. 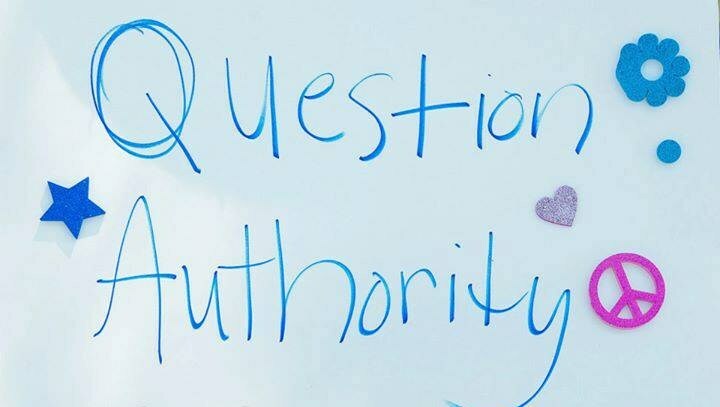 In my state (Florida) in particular, what midwives are “allowed” to do is highly regulated and under the watch of the state and the medical establishment. In essence, they play by the same rules. Midwives need to have relationships with doctors and hospitals– in case of transfer, they say. And transfer is very likely. Even when transfer does not occur, you are subjected to the many of the same birth routines and interventions as in a hospital. I chose midwives to escape medical trappings, and instead found myself in a new style of snare. I feel personally irresponsible suggesting to women that hiring a midwife would solve all her birth troubles. Yet, this philosophy seems like a large part of this movement. 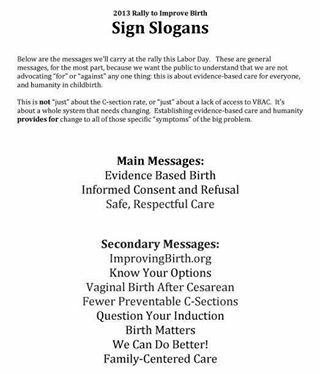 “Know Your Rights” (a great, popular Improving Birth sign) doesn’t save you if your midwife is telling you they can no longer legally serve you if you don’t submit to XYZ. That’s about the law, rules and regulations, and care not based on scientific evidence nor humane childbirth rights. That’s not at all about respecting or being with woman. The idea that our main dilemma is C-sections. I think the C-section is the ultimate intervention when we think of medical birth, that’s true. The numbers are outrageous. Many are unnecessary, that’s true. I’ve never had a c/s and I care, and I talk about this and how to avoid surgical birth all the time. Still, I get the strong sense that we are trying to tell women to merely avoid a c-section and their births will be better (and perhaps by merely hiring a midwife). There are other points women make on their signs about informed consent, or questioning their inductions, etc.– but I get the impression that this, too, is specifically to influence an avoidance of the dreaded C-section (and not as much because the induction in itself is unnecessary and harmful, for example). These are just the impressions that I’m getting. Now for the new things this year that gave me pause, even prior to hearing the supposed connection of Improving Birth and The Big Push. Signs should be from this pre-approved list. The same sign suggestions as last year were provided, only this time, there was an extra sense of “stick to the program”. It was discouraged to stray from this short list. This turned me off. Why? One, I am highly driven by my own passion to speak for myself. Two, I don’t like being told what to do (this is about Improving Birth… <<<this should make sense!). Three, the signs they encourage you to use, while often empowering in nature, are vague. “Know Your Options” (doesn’t everyone think they do? I know I did. Wrong!). “VBAC” (Yay, vbac! What about it?). “Evidence Based Care!” (yes, we’re all for this… even doctors say they are. Do they know they’re not giving evidence based care? Do women know exactly how they aren’t receiving it?). “Birth Matters” (yes, yes it does. Who would argue that?). Most people walk away from that feeling not-offended (<goal achieved) and automatically supportive of and even a member of this movement. But, what has changed? You may have people on “your side”, but that’s easy to accomplish when you won’t choose sides. The reason given by Improving Birth was that “our” message will be more heard if we aren’t all saying different things. They also didn’t want us to sound “angry”. What about my message? My message is part of our message. If birth needs so much improvement, why wouldn’t we be a little angry? I want to improve birth, too. I have great, specific things to say. I want to make people think. I want to change the way they look at birth and present their actual options, through provocative ideas and lesser known facts. So, I made my own list. I listened to Birth: Revolution Style’s radio show (scroll to the 90 minute mark) discussing the issue, where an Improving Birth coordinator (Heather Kimble) tried to answer some of these questions. She expressed that one factor influencing location is the wonderful medical professionals– doctors, nurses, etc.– who wanted to be involved in our rallies but could not, for fear of repercussions of doing so in front of a/their hospital. My problem with that is, they are doing a huge disservice to our cause if we bend to accommodate them so that they don’t get in trouble. The hospital is the most relevant place for this event. Our message stands to be lost or obscured elsewhere. If docs and nurses really want to help, maybe they’d be serving us better in the actual line of duty. That is where we need their support the most. Truthfully, it sounds like another way we are bending or bowing to the medical establishment. I want everyone to be able to have whatever birth they choose– the one they feel healthiest and safest with. That can’t happen if midwives are bound by certain medical regulations and standards. There was some talk on my page about legal vs. illegal. I said that I wanted all options to be “legal”. After listening to Magdalena on my page and the male caller from the radio show, I see that the terminology gets confusing. “Legal” implies there is also an “illegal” side to the coin, which means there is something to regulate. “Alegal”, or “lawful”, something which is not hindered by legislation, is perhaps a more correctly labeled goal. I can’t be worried about certain things, though, such as pleasing medical professionals and working with them on their requests or demands. That’s what is hurting us in our births, after all. I won’t worry about trying to keep my message bland or neutral. I believe it creates positive feelings amongst people, but that this inspires contentedness rather than change. An example of one of my signs this year. Something is still unclear about Improving Birth. Did they, do they, or don’t they have anything to do with The Big Push and/or midwifery legislation? Heather Kimble with Improving Birth was unsure during the radio show (linked above), but answering as best she could from what she had gathered, her feeling seemed to be that at one time IB had aligned with said cause(s), but is no longer after the reaction they’d received. If this is the case and Improving Birth is trying to distance itself from such goals and campaigns, I really think the best choice would be to publicly express this in an open way. It would really clear the air. I still believe in women uniting in any way they can to improve the climate of birth. I don’t count it out that I could attend future rallies in person, again. I think we need to know more about where Improving Birth stands, though. We also would be more powerful and meaningful as a movement if we were free to be ourselves. We were controlled in the delivery room… do we need to be controlled in the rally, too? When can we be trusted as women to lead our own way? If we’re all on the same team here, it’s okay if we disagree on the best way to spread the message, as long as we are out there doing something about it. I held a virtual rally on my page where I posted my past signs from last year, new ones I made this year, and ones from fans. I was heard, it resonated with people, and it felt nice/productive. The material had lots of shares and lots of positive feedback. Maybe someone learned something or felt more empowered, too. I’m happy to participate and do my part.